This kalkandu rice recipe is a quick alternative to regular sakkarai pongal. 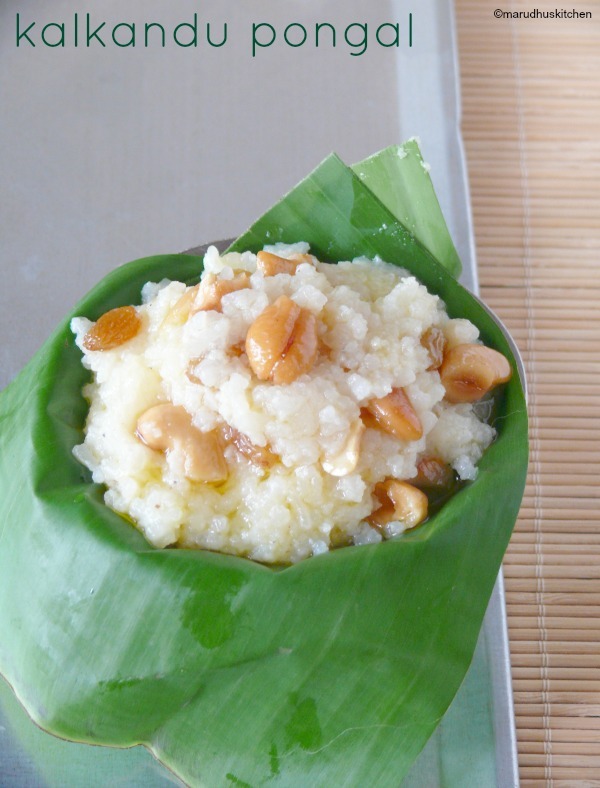 Kalkandu pongal is a predominant temple prasadam. The prasadam when made at temple is always special and has a unique divine taste.I believe that we can’t get the exact taste as temple ones when done at our home.Even the big solid sugar candy’s are available,you can use that also instead of normal sugar candy. Using saffron is more special for this kalkandu rice recipe,but I have not added to keep the white colour. You,can very well add it for a special aroma,even adding edible camphor(pachakarpooram) makes it more elegant. Instead of cooker you can use a thick pan with a closed lid but it takes more time to cook. Adding nutmeg powder is optional.You can mix half and half milk – water combination to do this pongal but cooking it with all milk makes it more rich. Always soak the rice before adding it to milk so that it cooks mushy and perfect. 2.Bring milk to boil in a pressure cooker when it boils add washed and soaked rice. 3.When it is 1/2 cooked ,close the lid and keep for 1or 2 whistles or till cooked. 4.Powder the sugar candy and keep aside. 5.In a separate kadai add ghee fry cashews to golden,then add raisins to puff up. 6.Open the cooker now the rice should be mashy or mash it further. 7.Add powdered sugar and cook till every thing comes together. 8.Then add powdered cardamom powder and grated nutmeg mix well. 9.At last switch off the stove add,fried nuts and raisins,mix and serve. Bring milk to boil in a pressure cooker when it boils add washed and soaked rice. When it is 1/2 cooked ,close the lid and keep for 1or 2 whistles or till cooked. Powder the sugar candy and keep aside. In a separate kadai add ghee fry cashews to golden,then add raisins to puff up. Open the cooker now the rice should be mashy or mash it further. Add powdered sugar and cook till every thing comes together. At last switch off the stove add,fried nuts and raisins,mix and serve. Instead of sugar candy you can use normal sugar. Don’t add sugar before the rice is well cooked,because after adding sugar the rice won’t cook. If you want to dry roast rice then do that way too. I soaked the rice for 30 minutes before adding to the boiling milk. 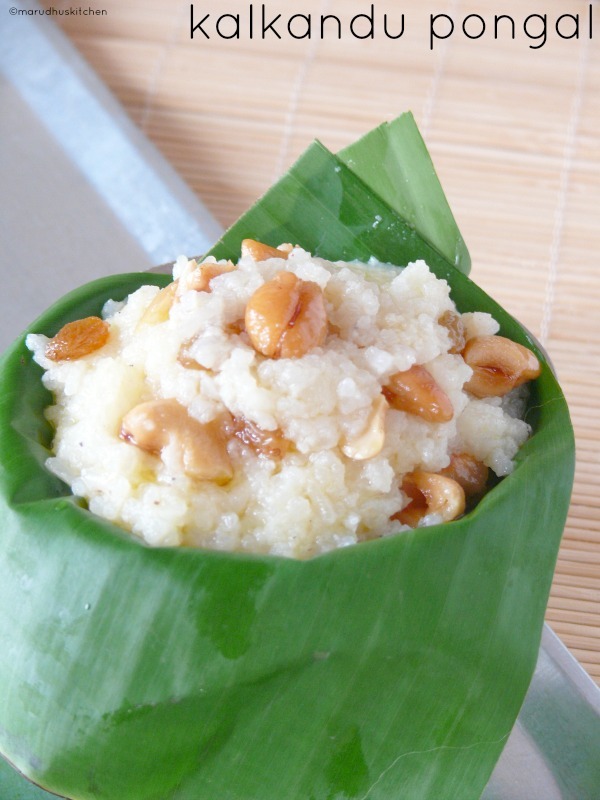 Yummy pongal Vani! Looks so creamy! !